In this file photo, a worker constructs a section of the border levee fence on Feb. 4, 2009, at the Old Hidalgo Pumphouse and World Birding Center in Hidalgo. 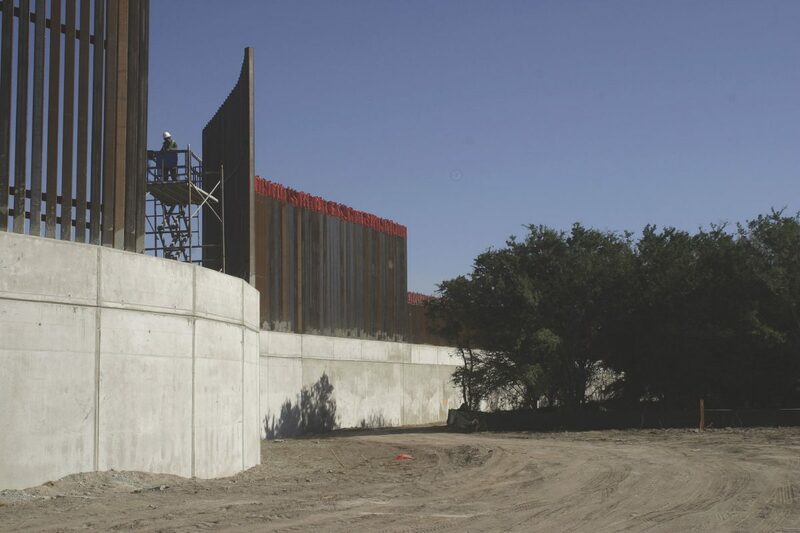 Last week, Congress approved an Omnibus spending bill that sets aside $1.6 billion for border wall-related funds in the Rio Grande Valley including 25 miles of border wall in Hidalgo County and eight miles in Starr County. Momentum toward a physical wall along the U.S.-Mexico border continues as more notices for construction contracts are made public. On Monday, a notice was posted for a multiple-award task order contract — or MATOC — for construction in the Rio Grande Valley and other locations “in support” of the Department of Homeland Security and RGV Border Patrol sector, according to a government website that publishes federal contracts. A multiple-award contract is a type of indefinite-quantity contract which is awarded to several contractors from a single solicitation. A total of 10 contracts “will be solicited on the basis of full and open competition (unrestricted), with a target of five unrestricted awards and a target of five awards being made to small business concerns for a small business reserve within the MATOC,” the notice states. The contracts will also be for construction in Laredo, Del Rio, Big Bend and El Paso Border Patrol sectors and the U.S. Army Corps of Engineers Southwestern Division and South Pacific Division, the notification states. Valued between $25 million and $350 million for the unrestricted awards, and between $2,000 and $25 million for small business awards, the contracts would be for construction that includes: “maintenance, repairs and alterations activities such as fence, wall, patrol roads, access roads, lights, gates for access to border monuments and maintenance, and for Border Patrol operational use, drainage improvements, levee walls, and other miscellaneous improvements, repairs, and alterations,” the website states. This is the latest in a barrage of moves made by the government toward the Trump administration’s goal of securing the U.S.-Mexico border with a physical barrier — an oft-made promise by the president during his campaign. The move comes on the heels of a planned gathering at Bentsen-Rio Grande Valley State Park, where people are invited to join members of the Lower Rio Grande Valley Sierra Club “to show support for the park and urge Texas Gov. Greg Abbott to actively oppose the levee-border wall that threatens it,” according to information from the group members. The event begins at 9 a.m. Saturday and ends at noon, according to a Sierra Club news release. John-Michael Torres, spokesman for La Unión del Pueblo Entero — or LUPE, a local immigrant advocacy group — said government officials should be holding stakeholder meetings with community members. “Trump’s border wall plans are moving forward, but we can slow them down or even stop them. Our members of Congress should call for a series of public meetings with CBP officials to share plans for the wall in our region and take into account feedback from the community,” Torres said. The bids went public just as Hidalgo County and Starr County landowners began receiving notices from the government about their properties related to subsequent attempts to survey land for the purposes of wall construction. Last month, Customs and Border Protection and the Army Corp of Engineers officials announced they would begin to reach out to landowners in the Valley to conduct “Rights of Entry for Survey,” or (ROE-S), in order to commence the real estate, environmental and design processes for the border infrastructure projects that were funded in CBP’s 2018 fiscal year plan. The moves come after the omnibus bill passed in late March, which approved $1.57 billion for physical barriers and associated technology along the Southwest border, including 90 miles of border wall system. Those 90 miles combine all projects spanning the Southwest border from San Diego to the Rio Grande Valley sector in Texas. The RGV sector is slated for 25 miles of new levee wall along the Rio Grande and 8 miles of bollard wall in Starr County, closing gaps along the border in the sector is also part of the border wall project, CBP announced following the bill’s passage. Just last month, Starr County officials confirmed that they met with government officials and were told during a meeting that the wall construction would begin east of the Fronton area and extend 5.5 miles into Escobares, but uncertainty remains regarding the downtown area. This is the second solicitation made public this year. In February, a contract worth up to $100 million was published, soliciting vendors to bid on a project that included the construction of 3 miles of levee wall system in Alamo, where Santa Ana is located, as well as the “installation of fiber-optic cable, lighting systems and construction of an all-weather patrol road and enforcement zone,” the notice stated. The contract was set to be awarded in early May, but that plan died after the omnibus bill was passed with Santa Ana, a federally owned piece of refuge left off the list of potential locations for border infrastructure. CBP spokesman Rod Kise confirmed the contract for a levee wall system in Alamo was removed. The awards are scheduled to be awarded by mid-August, the notification states.